The H-II Transfer Vehicle (HTV) is an unmanned inter-orbital cargo transporter to the International Space Station (ISS), which is flying at an altitude of about 400 km above the Earth. It delivers up to six tons of food, clothes, and various experiment devices to the ISS, then is reloaded with used devices and clothes to be burned when it reenters the atmosphere. On September 11, 2009, the HTV (Demonstration Flight) was successfully launched and achieved all planned missions including its on-orbit technical verification, its rendezvous with the ISS, and cargo transportation. 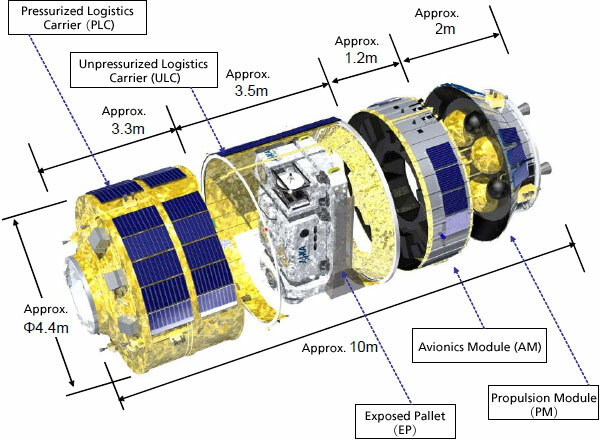 After the scheduled Space Shuttle retirement in 2011, the HTV will be the only transporter that can carry both pressurized and unpressurized cargo; therefore, its importance is increasing internationally. Nickname is "KOUNOTORI" meaning "white stork"
During a month-long nickname campaign, we received 17,236 suggestions. Among them, "KOUNOTORI" was selected because a white stork carries an image of conveying an important thing (a baby, happiness, and other joyful things); therefore, it precisely expresses the mission to transport essential materials to the ISS. Space in front of the cargo racks, and the opening space between racks. Collision avoidance maneuver, R-bar retreat/hold (*) etc.